up a stir at the Basecamp Tent on Sat. Searing speed highlighted this past weekend, along with powder dust-ups at finish lines, heartbreaking falls and lots of loud music that blared its way across the valley. Hotshot skiers and boarders were hailed as heroes by a grand showing of visitors and community members during the 48 Straight and Jeep King of the Mountain World Pro Championships. The event, founded by Ketchum residents Kipp Nelson and Steve Brown, went a few days longer than the advertised 48 hours, as the nonstop action never seemed to end. "We started with a pebble and the ripples go out," Nelson said about the Green Symposium that preceded the ski events. "Most of us consciously decided to live in nature and understand nature. We would like to do this again and grow it for the future." "Being balanced is a personal journey," symposium participant Mariel Hemingway said. "The most important journey of eco-consciousness for oneself is a spiritual journey." 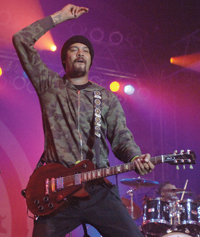 Musician Michael Franti made two appearances over the course of the event: at the Green Symposium and in concert. "It's a crucial time for our country and our planet," he said. "How can we reach out to other people, the earth and the planet? I feel it's not one person's job but everyone in the country." After speaking at the symposium at the Presbyterian Church of the Big Wood on Thursday, Franti performed a four-song acoustic set, much to the delight of the audience. Nelson said the Thursday night symposium was a highlight of the weekend for him. As well, he said that holding the event in March when there is more daylight and more bearable temperatures accounted for much of the success of the event. It was wild, totally fun and exhausting. And that doesn't just apply to the super-stud athletes, though their performances and feats were dazzling. For many, some of the fun was seeing Wood River Valley natives compete on such an exalted level. Among those who participated were Graham Watanabe, Taan Robrahn, Spencer Cordovano, Biche Rudigoz, Yancy Caldwell, Mark Oliver, Christine Cordeau and Langley McNeil. At Dollar Mountain on Friday and Saturday, there were gaggles of community members, friends and family on hand to cheer for those skiers and boarders. The VIP Tent and sponsor events set up alongside the base of Dollar allowed people to take refuge from the changeable weather. Sponsors such as Jeep, Monster and Paul Mitchell handed out swag. Lively and exciting, the Dollar Mountain events were bigger and better than last year and attracted many more to the thrills of Skier and Boarder Cross. At night, lights on Dollar emblazoned the name 48 Straight onto the slope, while in Ketchum, firefighters tended to huge bonfires alight around town during the street parties. Folks wandered in and out of venues including the 48 Straight Basecamp tent, where national acts rocked the hundreds of concert-goers. Franti and Spearhead in particular lived up to their reputation as a danceable and festive live act. "It was exciting to have that many options," a festival-goer from New Jersey said. "Where do you want to go? What do you want to see? Four straight days of races, hanging out in the sun on the slopes, the Green Symposiums over three nights and all the music." On Sunday, the scene coming off Lower Warm Springs at the end of the ski day was astounding. Thousands of people streamed down on foot and skis after enjoying the perfectly sunny day and watching the Half Pipe competition and the Monster Hit Competition. The young band Ellis Unit played outside at Warm Springs Lodge, while over at Apple's, The Damphools kept the crowd enlivened. The 48 Straight Fashion Show was held in the VIP tent at the base of Warm Springs with imported fashion models wearing fashions from Bogner, Rossignol and Jet Set as well as dresses from Burnsie's Boca, Paula's Dress Shop and The Brass Ranch. The four Snow Angels who'd been in town for several days were the stars of the show, beaming at and playing to their audience. The entire experience was similar to being dealt a winning poker hand over and over, Karen Day of Hailey said. "The death-defying races, the roaring crowds, the helicopters fluttering overhead like desperate paparazzi and music by bands named after body parts made me dance in streets like I had contracted an embarrassing affliction." Finally on Sunday, Nelson hosted the last party of the season for athletes, supporters, sponsors and patrons to celebrate the success of 48 Straight and his superlative efforts to bring skiing into a new era of cool.